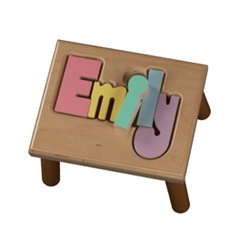 You can help a little one feel independent and they can learn to spell their name with a personalized puzzle step stool of their own. Each puzzle letter is colored with non-toxic paint and has smooth edges for easy fit. 8" x 9" x 12"
This step stool is custom made please allow up to 5-6 weeks to ship. Please note that this is a hand crafted product constructed of natural wood. There may be knots and natural markings in the wood. We are sorry, but we cannot leave a space between two names, nor can we capitalize a letter in the middle. Personalized items are not refundable. Copyright © 2014 Step Stool Universe. Built with Volusion Shopping Cart Software.